The money for the BIRR scholarships was provided by Richard and Virginia Alderson. Each year the BIRR five member scholarship committee reviews the numerous applications to made the awards. “It was the sheer love of running that initially drew me to this masochistic sport, but it was the camaraderie of the runners that made me stick with it,” Kaitlyn Chock said. It takes a special breed to become a long distance runner. A person becomes self-reliant on their own motivation and perseverance. As a high school cross-country coach for many years I have witnessed firsthand the multitude of prep runners that become distance runners. Recently, at Waiakea High’s athletic awards night, I noticed that the 20 girls getting their letters in cross-county all had an asterisk next to their names in the school program. The asterisk noted that those athletes also attained a 3.5 or higher grade point average, making them scholar athletes. The boy’s cross-county team had 27 of their 31 participants with asterisks, not surprising when you consider the demands made on a distance runner which require them to have a high level of internal motivation. Chock was one of those represented at awards night as she closed out her high school career with four years on the cross-country and track teams. 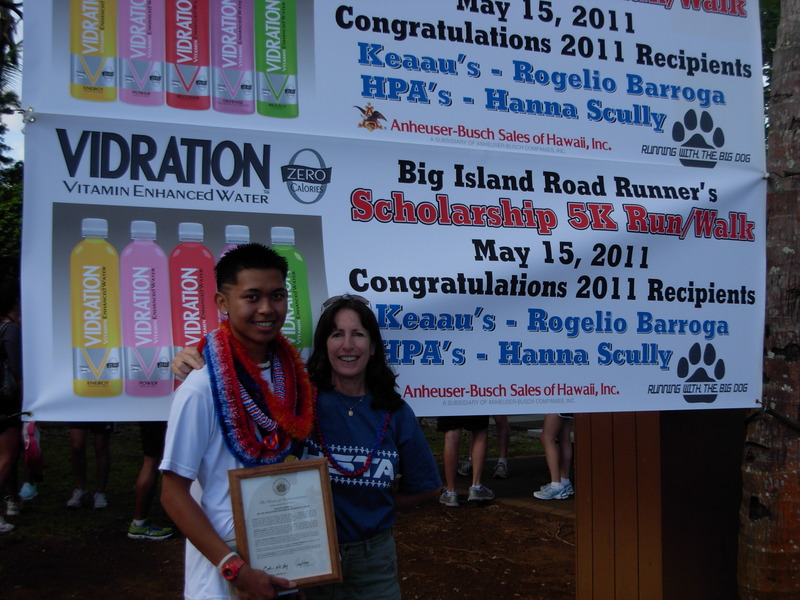 Little wonder why Chock along with Hilo’s Sai Weiss were recent winners of the Big Island Road Runners $1000 scholarship award. Both Chock and Weiss have demonstrated their deep love of running, coupled with their commitment to community service and a high GPA. On Sunday Weiss and Chock were on hand for the BIRR Scholarship 5K (3.1-mile) run/walk held at Coconut Island. Both youngsters had just graduated over the weekend and participated in the event, which culminated in them being recognized as the BIRR scholarship awardees. At the start of the 5K race several runners jockeyed for the lead position and by mile one a pack of four had developed with Jackson Halford, Justin Pang, Alan Ryan and Rick Michels. Pang, a University of Hawaii-Hilo cross-country runner and former Christian Liberty standout, led for the first two miles with Waiakea’s Jackson Halford just a step behind. The duo ran a blazing 5:36 final mile to distance themselves from the rest of the 80 plus runner and walkers in the field. Ryan won the exciting race by clocking in at 18:07 with Pang one second behind. Pang finished in third at 18:15, followed by Michels, 18:57; Steve Pavao, 20:07; Tchad-Tu Henderson, 20:24; and Stewart Miyashiro in 20:30 rounded out the top men. 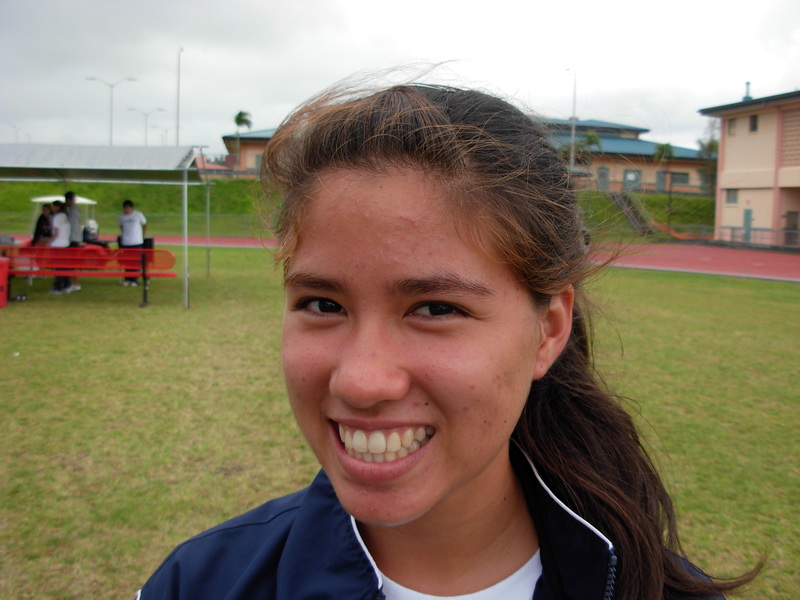 For the women it was all Lory Hunter as the Hilo High cross-country and track coach finished in 22:29 with Kim Rojo second, 24:40; Shell Hamilton third, 25:23; and Joanne Pocsidio, 27:01, rounding out the top women. “This was a fun race,” Hunter said after winning the women’s division. “I’m not only glad that I got to run, but I’m also happy to be here to support both Sai and Kaitlyn in winning the BIRR scholarship award. At the finish line Kaitlyn Chock was handing out finishing numbers and helping race officials while Sai Weiss was running in the race and finished eighth overall. Weiss graduated on Friday night and was all smiles and filled with energy in doing the 3.1-mile race. “I’ve always liked coming out and participating in community races,” Weiss said. “Running is something I enjoy and look forward to doing. 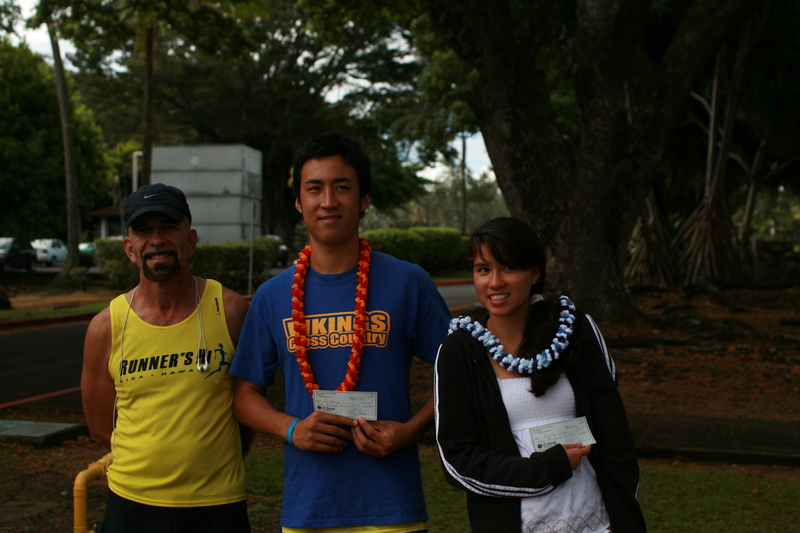 Big Island Road Runners president Steve Pavao presented Weiss and Chock with their $1000 checks in an official ceremony after the race. 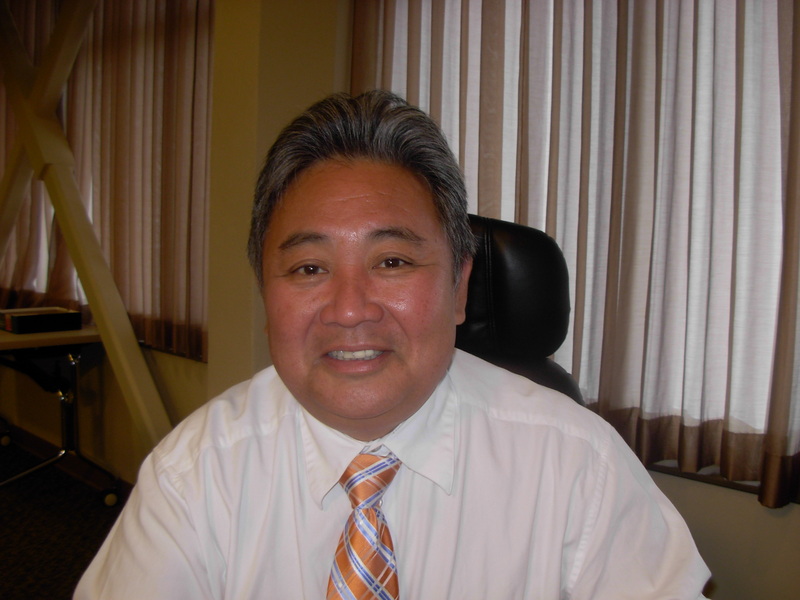 “The BIRR is very proud of our community involvement and in our two selections for this year’s awards,” he said. 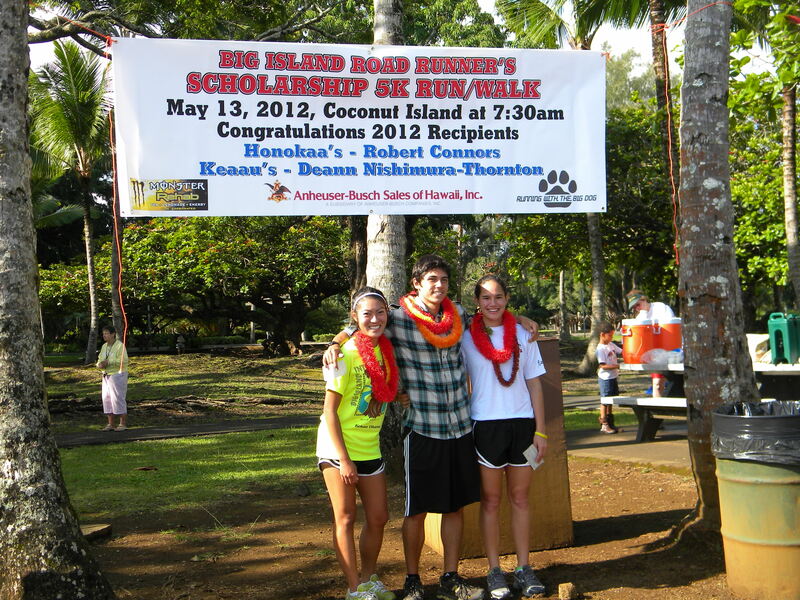 On Sunday, May 23, the Big Island Road Runners along with Big Dog Productions will host the Scholarship 5K run/walk starting at 7:30 am in the parking area of Moku Ola, Coconut Island. 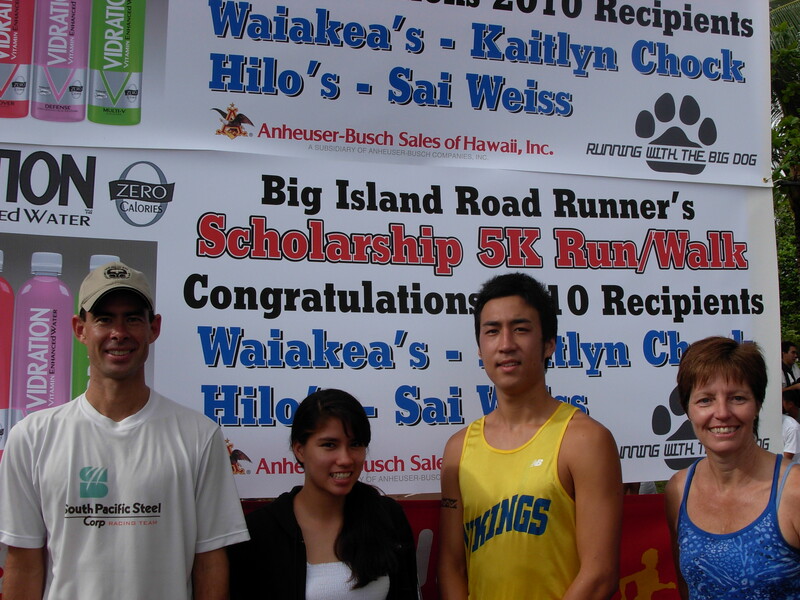 Following the fun run/walk the BIRR will presents a check for $1000 to Hilo’s Sai Weiss and to Waiakea’s Kaitlyn Chock. The public is encouraged to attend both the run/walk and the scholarship ceremony. 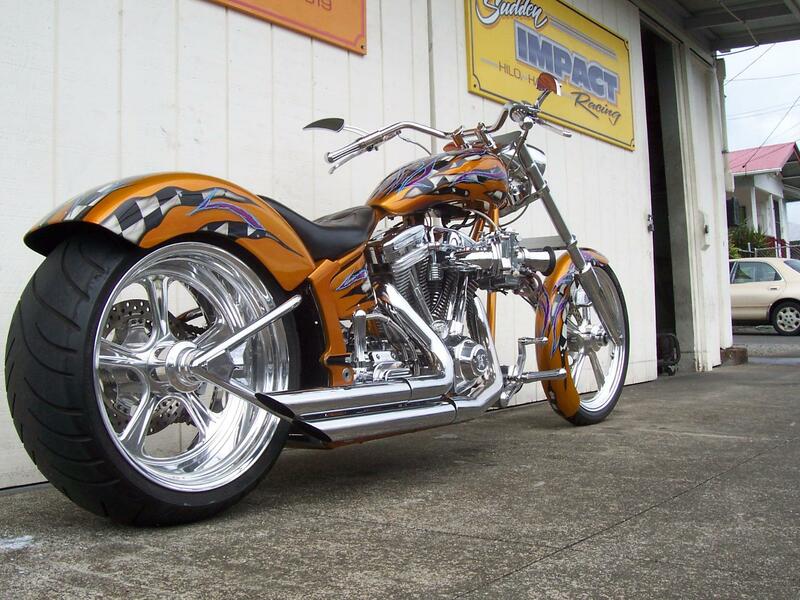 For more information contact the Big Dog at 969-7400. A few days ago members of the Big Island Road Runners scholarship committee met to look over the many applications sent in by prep runners seeking the one of two $1000 cash awards that is to be presented this year. 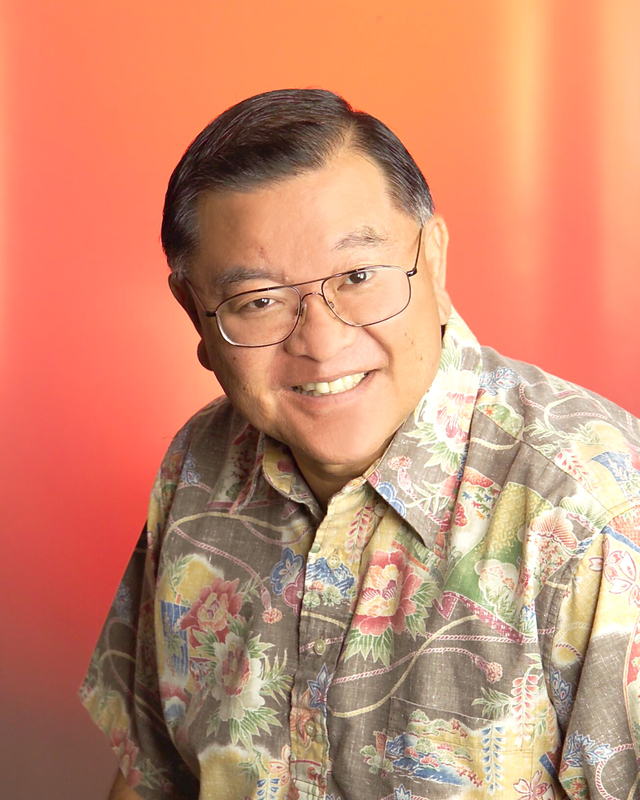 Thanks, in part, to a generous gift provided by Richard and Virginia Alderson the BIRR, since 2006, have been giving away cash scholarships to at least two deserving high school seniors from the Big Island. What is impressive is that all of the past awardees were scholar athletes and most went on to run cross-country in college. Barbis, Williams, Hagemann, and both Ucker’s currently run for Jaime Guerpo and the University of Hawaii at Hilo Vulcan’s, while Yamamoto was a walk on at UH Manoa this past season and claimed the important number seven spot for the Rainbows. This year the scholarship committee chaired by Big Dog, with voting members Dano Banks, Joseph Kamelamela and the Alderson’s meet to look over the qualified applicants and read over their essays on how running has influenced their lives. After careful review the scholarship committee selected Hilo’s Sai Weiss and Waiakea’s Kaitlyn Chock. Both Weiss and Chock ran cross-country and track all four years at their respective schools and both are academically gifted with Weiss carrying a 3.5 grade point average and Chock a 3.9 GPA. 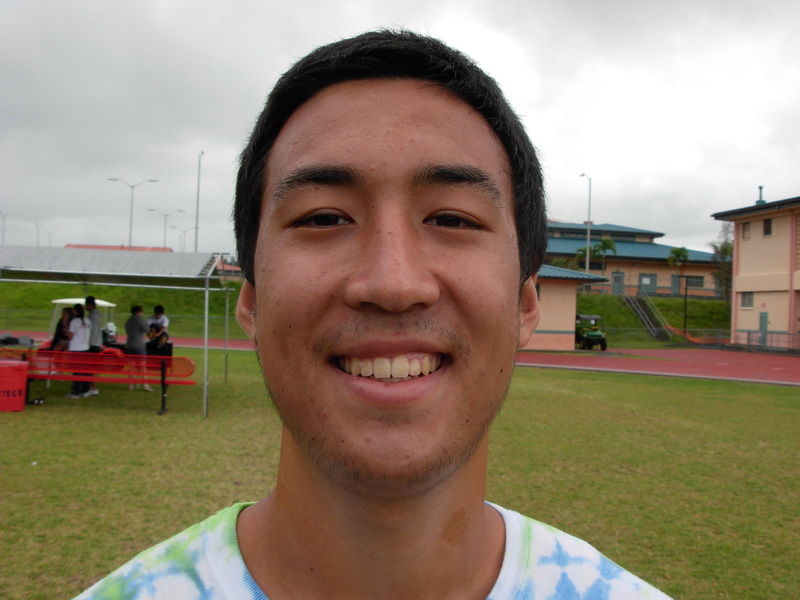 Chock is also a gifted athlete winning Waiakea’s Most Outstanding Athlete award in cross-country and track for the past two years. The multi talented Warrior also helped anchor her swim team in both relay events. 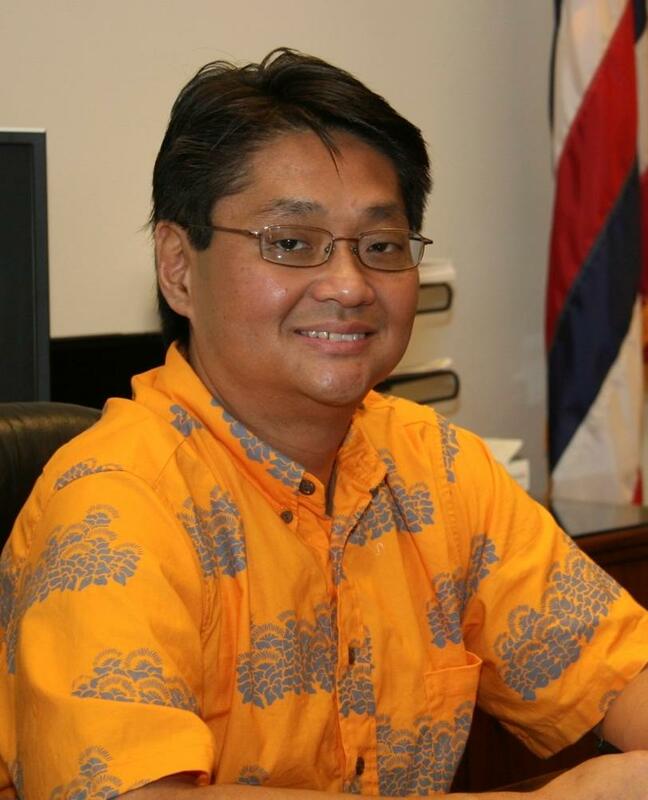 Both Weiss and Chock are Key Club members and have chaired various community activities from helping with the Big Island International Marathon, to volunteering with Special Olympics track & field events. “We are so pleased that there are so many fine young and men and women in our public school system and Sai and Kaitlyn are two fine examples,” Richard Alderson said. “The only problem we have had with Sai over the years is that sometimes he can’t attend our aikido class and events because he’s busy with those troublesome track meets,” Sensei Klein said with a smile. Weiss has been accepted to Southern Oregon University and Chock will be attending the University of Oregon, Robert D. Clark Honor’s College. Weiss plans on majoring on Environmental Studies and Business while Chock plans on entering Liberal Arts. 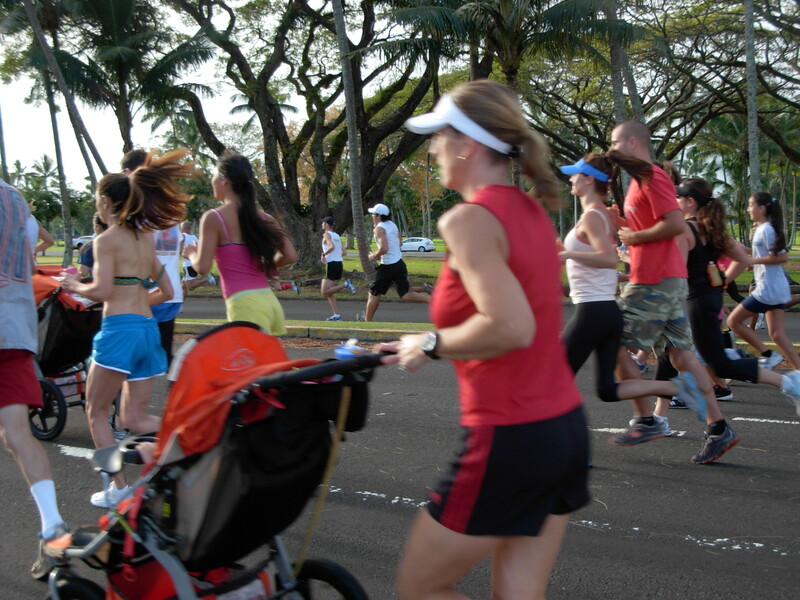 The BIRR which was founded as a nonprofit organization in 1973 has been promoting health and fitness through running and walking events in East Hawaii will recognize Weiss and Chock in a formal ceremony at the end of their Scholarship 5K (3.1-mile) fun run/walk on Sunday, May 23. 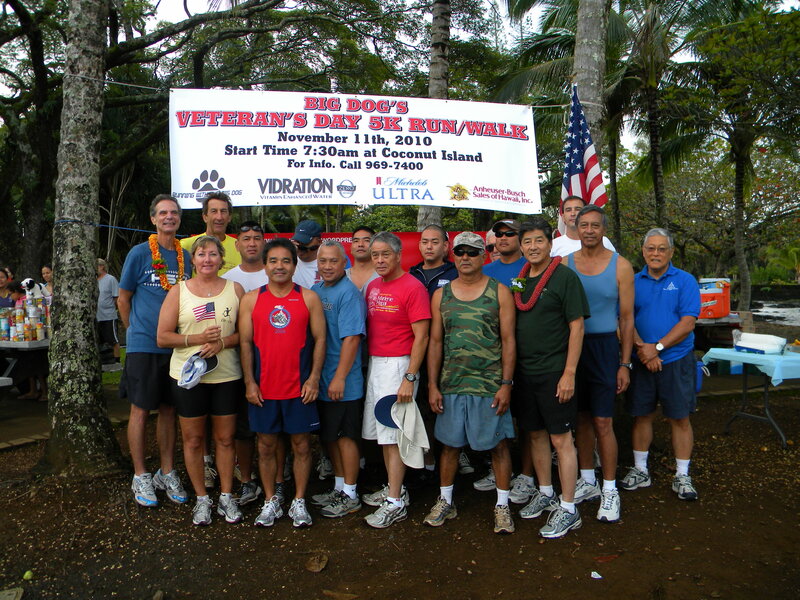 The Scholarship Run/Walk starts at 7:30 am near the entrance to the Moku Ola (Coconut Island) parking area.